The taotie wasa popular subject at the court of the Qianlong emperor and probably before, but if this were made much earlier than 1736, we would expect the glass to be crizzled. 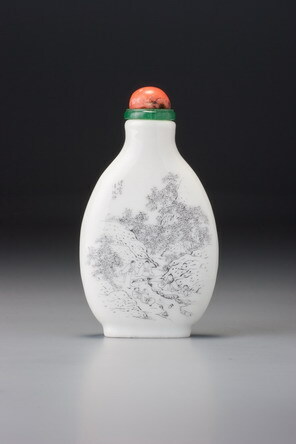 The early Qianlong era is most likely for this bottle, with the Imperial glassworks still the most likely provenance, although we have refrained from a firm attribution in this case, simply because the style is so unusual. 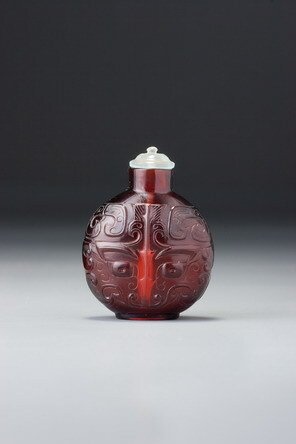 The mouth is very wide, which is typical of glass bottles from the first half of the century and the Imperial glassworks. Of all known early examples of this motif serving as main decoration rather than as a handle, this bottle is among the most impressive. The subject is more three-dimensional than most, with varying levels of relief and well-rounded details. This clarifies the often complicated linear expression of the diagram, making it more easily read. It also represents the best of Qing archaism, in which formalized archaic motifs are balanced between varied relief work (where curlicues, for instance, come spiralling towards the observer out of flatter, formalized motifs) and simple, engraved lines. The origins of this mixture can be found in archaic jade-carving techniques. The face also follows a standard archaistic formula in that, while obviously a taotie face, its elements can also be interpreted as other creatures. The fancy horns, for example, double as simplified kui dragons, eyebrows flaring upwards between the horns and metamorphosing into a rather impressive pair of adorsed birds coiffed with exotic feathery tufts. All of this strengthens the reference to the ancient culture.